Knitting patterns are usually written with a certain type of yarn in mind, meaning that the designer has put lots of thought into the characteristics of their chosen yarn as this will impact the finished piece of knitwear considerably. Therefore when choosing yarn for a pattern, it is good to understand the yarn characteristics of the designer’s recommended yarn so that you can choose a yarn that matches these as much as possible. 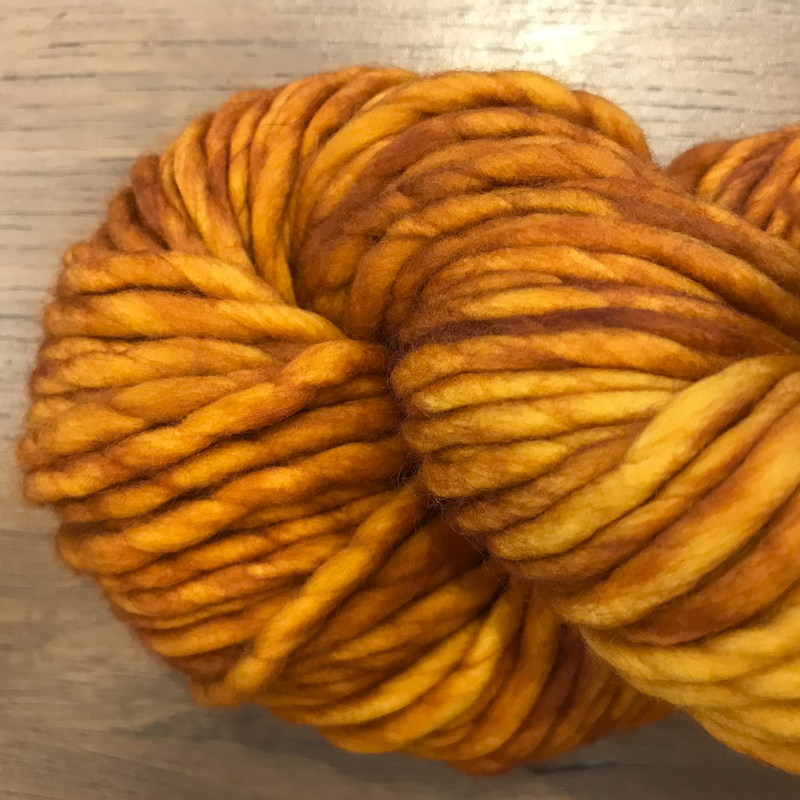 This obviously covers the yarn weight, which we will address briefly but there are other descriptions to understand such as lofty, bouncy, worsted or woollen spun which will all be explained so that you can be fully equipped to choose the best yarn for your project! Let’s start with a quick look at yarn weights. Yarn weight essentially refers to the thickness of the yarn and is a big factor (though not the only factor) when it comes to choosing the right yarn for your knitting pattern. The knitting pattern will be written for a specific yarn weight and this will be specified in the pattern description. There can however be slight discrepancies between the thickness of yarns even within a yarn weight category, for example two Double Knit weight yarn can be quite different. Therefore the most useful way to choose yarn for your project is to look at the gauge of the designer’s recommended yarn. This is usually found on the yarn band or can be found by searching for the yarn on Ravelry. The gauge tells you how many stitches and rows there are over stocking stitch in 10 cm / 4 inches on a certain needle size. The yarn you choose for the knitting pattern must therefore match this gauge. Below is a list of the yarn weights we stock here at YAK along with their typical number of stitches in 10 cm / 4 inches. This is taken from a more extensive table from Ravelry found here. As mentioned above the yarn weight is not the only factor to consider when choosing yarn for your knitting pattern. In this second section we will have a look at some definitions of terms often used to describe the characteristics of yarn. These are the factors to consider when choosing your yarn with the aim of matching characteristics as closely as possible to the designer’s recommended yarn. A ply is another word for a strand. Most yarns have several plies twisted around each other. This can be seen by gently untwisting the yarn which forces the the plies to come apart so you can count how many have been twisted together. Single ply yarns however have just one ply and this impacts the characteristics of the knitted fabric. Single ply yarns are usually softer and often have a slight fuzzy halo. They also often have a less distinct stitch definition than a yarn with several plies. The finished fabric usually has a light, airy feel due to the lack of twists and open nature of the yarn. Malabrigo Rasta and Hedgehog Fibres Skinny Singles are both single ply yarns. This is often used to describe yarns that trap and hold pockets of air. Single ply yarns are more lofty than multiple plied yarns and woolen spun yarns are more lofty than worsted spun yarns (but we’ll come to that next). Lofty yarns usually result in light fabrics that are good for all year wear. They are good at holding warmth when needed while being breathable to keep you cool. This is refers to two different ways that yarn is spun, determined by the fibre type, the preparation of the fibres before spinning and they way in which they are spun. The fibres used in woolen spun yarns are long fibres lying parallel to each other. Prior to spinning the fibres are carefully prepared to ensure that they are left untwisted and aligned in this parallel arrangment before entering the twisting phase. Worsted spun yarns are smooth, firm and strong. The lack of air pockets in the yarn results in a resilient, dense fabric with good drape. The knitted fabric they produce will have good stitch definition making this a good yarn choice for cables and stitch patterns. Vale from Brooklyn Tweed is a good example of a worsted spun yarn. Woolen spun yarn is made from shorter fibres. During the preparation phase, these fibres are not arranged to lie parallel to each other as with worsted spun yarns. This means that the fibres are jumbled up inside the yarn, trapping plenty of air inside. This creates a fluffy, soft, warm and lofty yarn. Woolen yarns are very versatile when it comes to gauge. This is because they tend to bloom when soaked in water, where the fibres bloom to fill the available space they have. Because of this the stitch definition is not as crisp as with a worsted spun yarn, but they are good for colour work as the yarns blend together well. De Rerum Natura’s Ulysse is a woolen spun yarn and is a good example of a yarn that blooms when blocked. This is used to describe yarn that has a silky glow or a slight shine to it. Mohair and silk are often described in this way. Drape can be described as the fluidity of the fabric. Fibres that create a knitted fabric with drape are long fibres with little crimp. Plant fibres are good examples, but also mohair and alpaca have good drape. These yarns are good for projects that don’t need to hold their shape, for example shawls or garments intended to flow. Finally, a yarn describes as having good elasticity is bouncy and stretchy. This is the result of either the fibre having high crimp or due to the way its spun. Yarns that are tightly plied with lots of twist tend to be more elastic. These yarns will produce fabric with good stitch definition which is resilient to loosing it’s shape even with lots of wear. We hope this post illustrates how the characteristics of the yarn you choose can have a big impact on the finished knitted garment and we hope this will help when it comes to choosing the right yarn for your knitting pattern. Finally, if there any other useful terms we could include here, let us know in the comments!